Philip Cummings was a natural student, intellectually curious and highly motivated to learn. He read widely on a broad range of topics and actively pursued subjects that interested him through both formal coursework and independent study. Cummings hoped to complete a PhD in Spanish literature and teach at a college or university, but without financial support from his family, he had to approach his higher education in stages. Whenever his money ran out, he worked as a language teacher long enough to build up funds for his next course of study. And wherever he took classes, he also served as a teaching assistant or tutor to help pay his way. Circumstances intervened and Cummings never completed his doctorate, but he continued to pursue his varied intellectual interests throughout his life. 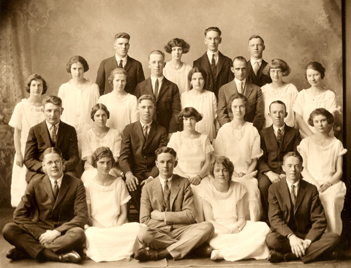 Hardwick Academy Class of 1924; Philip Cummings 2nd row, 3rd from left. Photo courtesy Hardwick Historical Society. The [Christmas] card supreme of the mail was from the head of the Spanish department of Middlebury College, under whom I studied and taught last year. He is the greatest teacher I have ever known. To be half the professor that Dr. Juan Centeno is would be ambition enough for me. [Bécquer's] life and his prose works were to be the subject of my Doctorate thesis, which has been put off until an indefinite period due to crippled finances... I have completed about all there is to be done until the bourse permits my return to Spain, where I shall be able to dig out some more research and win, very much Deo volente, the coveted supreme sheepskin.